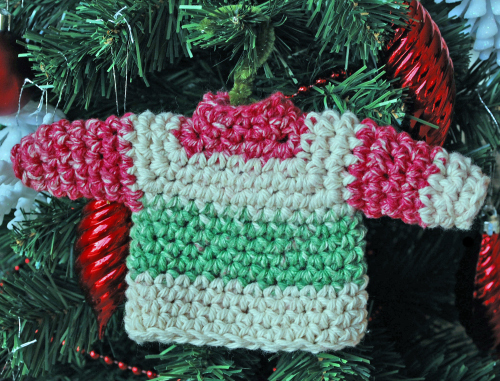 Of all the things I can make with yarn and a hook, my favorites are the things that serve no purpose but look adorable. 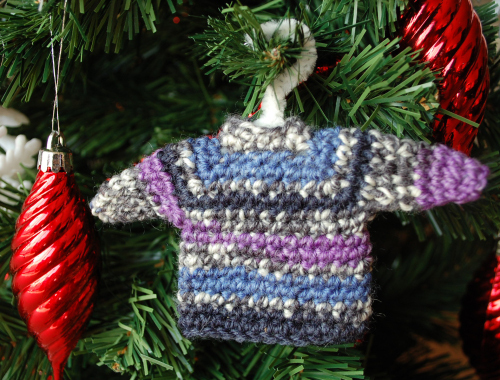 That’s the explanation behind this tiny sweater, which is the perfect size to use as a Christmas ornament. As a bonus, it’s also a great way to get acquainted with top-down raglan construction! Lion Brand Magic Stripes [75% wool, 25% nylon, 330 yds/100 g skein] for small sweater; Bernat Handicrafter Cotton Holidays Stripes [100% cotton, 138 yds/80 g skein] for large sweater. Gauge is unimportant in this project, as long as a close fabric is produced. 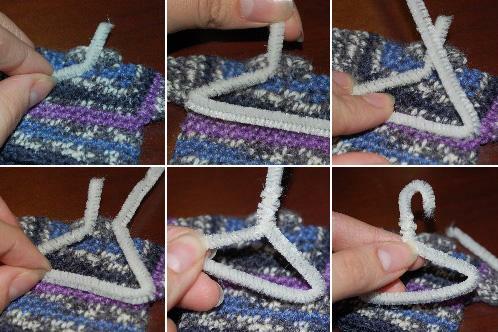 Different hook and yarn combinations can be used to produce sweaters of different sizes. Insert hook in first st, yo, draw through first lp on hook (2 lps on hook), insert hook in next st, yo, draw through first loop on hook (3 lps on hook), yo, draw through all 3 lps on hook. Ch 12, join in a circle with a sl st.
Ch 1, sc in first sc and in next sc to marker. (Sc in marked st, skip sts between markers, sc in next marked st, sc to next marker) twice, sc to beginning of rnd. (26 sts) Do not join. Note: Place marker in first st of each round to assist in keeping count of rounds. Sc around, sl st in 1st (marked) next st, finish off. Join in armhole at underarm. Ch 1, sc around. (11 sc) Do not join rounds while making sleeve. Do not join rounds while making sleeve. Sc around (5 sc) Sl st in 1st st of rd 6, next st, finish off. Using needle, weave in ends.